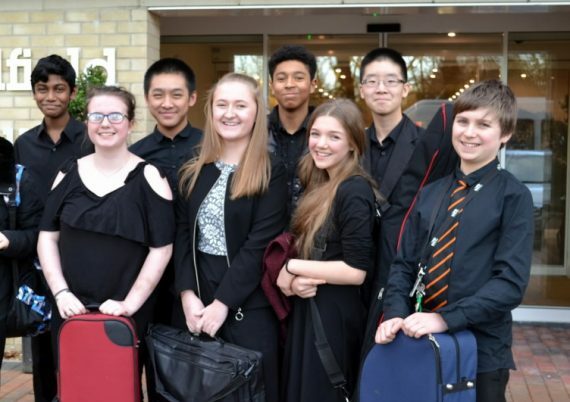 On Friday 2 February, the residents of Broadfield Court, a retirement living complex in Prestwich, were treated to a concert given by Year 9 and 10 students as part of Chetham’s Community Music. Their wide-ranging programme of solos and string quartet pieces included Schumann, Dvorak and Rachmaninov, and a jazzy flavour added by music by Scott Joplin, Leonard Bernstein and Jim Parker. Usually heard playing his bass guitar, second study singer, Keiron (aged 14) got an extra round of applause for singing a solo for the first time in a public concert; “Not too scary”, he said. Afterwards, students and older people, including a 93-year old former cellist from St Petersburg, swapped stories; “I loved the music, but I really enjoyed talking with the young people”, commented a member of the audience.